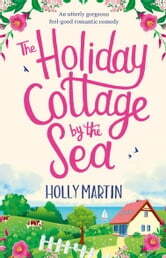 The new book from the bestselling author of Summer at Buttercup Beach. Escape to Sandcastle Bay, where you’ll discover a charming little seaside village brimming with heart-warming friendships, quirky characters and plenty of sunshine. I was promised a gorgeous feel good romantic comedy and did I receive it? Yes! I certainly did. I loved the banter between Tori and Aiden and that put, more than once, a smile on my face. I loved Sandcastle Bay and the way people took care of each other. I loved the romances, some of them still hidden but definitely budding and some clearly already surfacing. Maybe I should say what I did not love? Well, ... nothing!!! It's the first time I read a book from this author but I will not be my last. I am so angry with myself that I did not discover her books a lot sooner. It is summer reading for sure, but the warmth that seeps from the book, will certainly warm your heart in winter as well. When (and not if) you read it, make sure you have some time off, because you will not want to put it down. I did not read about Sandcastle Bay, it felt like I was in Sandcastle Bay. Thank you, Netgalley and Bookouture.